Where should you go hawkwatching? Massachusetts birders are fortunate in having several excellent sites from which to choose. Two of the state’s premier fall hawkwatching sites are discussed in some detail below. Go to either of these locations in September, on a weekend in October and early November, or many weekdays in those months with a nice cold front, and you are likely to find another hawkwatcher or two. Additional pairs of eyes are quite valuable, and their experience might be helpful in identification. Wachusett Mountain averages roughly 11,000 hawks a season since 1977. That total represents primarily September, as earlier and later coverage is less extensive and varies considerably from year to year. With more coverage in October and early November the average would be somewhat higher. You need not go to a major site to see a good flight, however, especially in September. Massachusetts has many excellent but lesser known and infrequently covered hawk watch sites, one of which is briefly described below. Historically, people have also watching spring raptors at Wachusett (The Ledges), and Mt Watatic (sw viewpoint on Blueberry Ledge/Wapack trail). In the fall people have also hawk watched from Great Meadows National Wildlife Refuge, Dunback Meadow in Lexington, and many other locations with a fairly clear horizon from northwest to northeast. When you go hawkwatching, take clothing more than adequate to keep you warm. Always take a hat, gloves, and at least a light jacket. It can turn quite cold on windy, exposed hawkwatch sites. Also take adequate food and drink. If the hawks are flying, you won’t want to leave the site in pursuit of physical sustenance. It\'s also advisable to take binoculars (and a spotting scope if you have one), a compass, a notebook, and one or more friends with you. The more eyes the better. The compass will help you evaluate the view as well as determine flight directions. The notebook is for recording the numbers you count, the time you see each bird or kettle, and what you observe about the hawks, including questions you have about the birds you can’t identify. Using your binoculars and scope, you should regularly scan the sky in all directions, including directly overhead and behind you. It\'s amazing how many hawks can pass by unnoticed, only to be seen flying away from you! However, most of them should be coming from the north and passing you. Because of the location and terrain, they might well be passing to your left or right when you’re facing north. Finally, you should take a field guide with you, so you can look up those questionable birds when things slow down. If you are a photographer, please take your camera. A 300 mm telephoto lens is the minimum; a 400 mm or zoom lens is recommended. The five sites listed below are on HawkCount.org. Only official site coordinators are authorized to enter data directly onto HawkCount for those sites. If you want to hawk watch at another site, such as a familiar park or landmark, please record data in a notebook or on an EMHW field form. Prior to hawk watching, download a Hawk Migration Association (HMANA) Daily Report form and a separate instruction sheet from (You can also download an EMHW Daily Field Form from our site as well, recording your observations by individual bird/encounter, to help assemble the data for the daily report form.) The HMANA form shows you the weather and site parameters requested for data to be entered into HawkCount. Observers are asked to record parameters such as wind speed, wind direction, temperature (C), cloud cover, visibility, etc., hourly, along with the hawk count by species each hour. Transfer the data from your notebook at the end of the day onto the Daily Report Form (DRF) to mail to EMHW, or contact any EMHW site coordinator via email to submit your data via email. EMHW will report your data to HMANA. The best-known fall site in Massachusetts is Wachusett Mountain (2006 feet), a Monadnock offering excellent views in all directions. Two primary advantages of Wachusett are its proximity to many eastern Massachusetts birders – it is only an hour west of Boston and less than half an hour from Worcester – and that you can drive to the summit, where there is a parking lot just beneath the summit. The state reservation auto road to the summit opens daily at 9 a.m. from Memorial Day weekend through October 31. There is a fee for each car entering the reservation summit road: $5 for a Massachusetts license plate and $10 for an out-of-state plate. Annual and senior passes are available for purchase at the gate. If you prefer to hike, there are a number of beautiful trails to the summit. Some begin at the Visitors Center at the base of the mountain. Others start at various points around the base of the mountain where limited free parking is available. Check the reservation website for a trail and parking map. When the road is closed, the Pine Hill Trail is the shortest, quickest, and of course steepest route to the summit, requiring about twenty minutes. Less experienced hikers often hike the shorter “down road” up. The main site for hawk watching is on the summit, on a relatively new large observation deck recently built affording a full 360-degree view. In fall it’s best to watch facing north, east or west in that order. The platform can easily accommodate several dozen people and offers benches on each side. You can also bring a lawn chair to watch on the bare summit next to the platform. There are porta-potties just to the west of the summit parking area. Bring all food and beverages with you, and dress in layers. Even in mid-September, it can be cold on the summit, especially if there is a clearing cold front and a brisk northerly wind. Keep a jacket, hat and gloves in the car, just in case. Our site coordinator, Rod Chase, begins partial coverage about five days a week from August 20, especially on days when cold fronts are passing. Rod or other site leaders are present daily from Labor Day through September, and most weekdays in October with good migration weather until the road to the summit closes October 31. The official watch site is on the summit from the observation platform, but several other sites can be used in the fall, especially for casual watching. The Oxbow, located a little more than a quarter mile hike up the road from the Visitor’s Center is actually on the "down road" only a few hundred feet from its merger with the "up road." When winds are 30-35 mph+, the thermals that provide hawks free lift over the summit are often blown apart, encouraging hawks to rely more on orographic lift, created by wind deflecting off surfaces like mountain slopes or ridges. Also, some species, such as sharpshins, tend to be ridge fliers, using orographic lift to help them migrate and often to hunt in the process. Even under prime thermal conditions in September, with Broad-winged Hawks kettling by hundreds or thousands, a number of sharpshins, kestrels, and other hawks might skirt beneath the summit but might be visible from the Oxbow, which offers a relatively narrow view of the horizon on the northeast side of the mountain. Late in the season, when you’re looking for birds such as Red-tailed and Red-shouldered hawks that don’t migrate as far as Broad-winged Hawks, the Oxbow may offer excellent views of migrants that might not be seen from the summit. The North Overlook is located on the gated North Rd, just after the Semuhenna Trail crosses the up road. There are several parking spots along the main road and you hike perhaps 200 yds down the road to the overlook to the northwest. On days with weak westerly or even southwesterly winds, you can also hawk watch from the “Ledges”, a pullover with a view to the south located on the “up” road before you reach the summit. It can occasionally be productive when birds use the orographic lift off the mountain to aid their migration. Click to view/download an informational flyer about Wachusett Mountain and HMANA. From north, east or west, take Route 2 to Route 140 (south) in Westminster. Take Route 140 south several miles to Wachusett Lake, where you turn right onto Mile Hill Road, following the signs to the Wachusett Mountain Ski Area. Drive past the ski area to the reservation entrance partially up the mountain on your right. Restrooms and water are available in the Visitor Center to your left. Immediately inside the reservation, turn right again onto the all-weather road to the summit. From south take Route 31 or 62 to Princeton. From Princeton center take Mountain Road north. As you reach the top of the “hill” the entrance to the reservation is on your left. If you reach the Ski area, you’ve gone too far. Mount Watatic (1832 ft.) has emerged as one of New England’s top hawk watching sites. The hawkwatch is on the bare summit of East Watatic, roughly a hundred yards southeast of the main summit. There is no auto road. You must hike to the summit. Trails include a steep .25 miles hike to a much gentler and more beautiful 1.3 miles to the summit. Watatic, the southern terminus of the twenty-mile-long Wapack range or ridge, is an excellent site for observing thermal and ridge fliers, offering excellent views into October and November. From Boston, take Route 2 west to Route 31, then 31 north to Route 12. Follow Route 12 to Ashburnham, turn right onto Route 101, and take it to Route 119. Turn left onto Route 119. Continue 1.5 miles west on 119 to an off-road parking area and an old logging road on your right. The Wapack trail starts .2 miles from the parking lot and is well marked with signs and yellow blazes along its 1.1-mile, approximately 45-minute route to the summit, the most direct route from this lot. A 1.6 mile trail continues north from the junction with the Wapack/Blueberry Ledge trail that turns east and up .2 miles from the parking lot. This longer trail follows an old logging road up to Nutting Hill, joining the Wapack Trail “down” from the summit. This is a beautiful hike and offers a nice hike down from East Watatic to the parking lot. A third, informal trail starts on Route 119 approx .7 miles west of Route 101. There is a small roadside parking area at the base of the mountain where an old power line climbs quickly to the summit. This .25 mile unmaintained trail is steep but the quickest route to the summit. East Watatic is quite exposed to strong winds; pack adequate clothing and beverage. Water and restrooms are not available on the mountain. Located in the southeast corner of the Middlesex Reservation in Malden, Pinnacle Rock is essentially a fall coastal hawk watching site approximately 200 feet above sea level. The hawks seen are primarily accipiters and falcons, and like other coastal sites, strong westerly winds are generally required for significant movement. Since it is located just north of Boston, hawks moving down the coast often pass virtually over the rock as they alter their flight to the southwest to avoid Boston. Although the numbers of hawks observed may not be very high, the birds often pass close and low giving dynamite looks. Coverage varies from 15-100 hours a year, primarily from the last week of September into mid-November on days with strong west or northwest winds. The site offers an opportunity to look for migrating hawks very close to home if you live in Boston or the northern suburbs. To get to gate 52 first find the first parking lot on Fellsway East [in Malden], just north of East Border Road. The map at the parking lot will indicate the Rock; it's in the extreme southeast corner of the Fells Reservation. Cross the road and head south toward East Border Road. Shortly on your left will be gate 52. Follow the Rock Circuit Trail (white blazes). It will lead you right onto the Rock. When you get there, the only hill to the south will be an old metal tower with a radio antennae/ airport beacons? [Some of them were round disks, but as of this writing only one remains]. To get to gate 56, park on Woodland right off East Border Road. The gate will be directly opposite Woodland on East Border Road. [On the map this is labeled Pinnacle Rock Path]. Walk up the path to the crest of the hill. The radio tower will be on your right. Crest the hill and go down the other side. On your right you will see the Rock. At the bottom of the hill on your right you will see a fallen tree trunk lying in the trunks of another tree. Head up this hill and you will see a path to the top of the Rock. [It is possible to walk to this entrance from the Orange Line (Oak Grove Station), although it is a bit of a hike]. You can explore for good hawk watching sites near your home or place of work. (Lunch hour hawk watching can be very productive.) Look for open spots affording a relatively clear view of the northern horizon from west to east. Most fall migrants in eastern Massachusetts move on a northeast–southwest line from (very) roughly the Augusta, Maine, area. Thus your chances of seeing larger numbers are best as you head southwest through eastern Massachusetts. Northern Essex, Middlesex and Worcester counties have the greatest potential. Hilltops, parks, whatever. In the immediate Boston area, Great Meadows in Concord and Dunback Meadows in Lexington can be productive. During Broadwing migration, even large shopping malls can be productive. Our two main spring coastal sites, Pilgrim Heights and Plum Island, average roughly 1,700 and 1,100 hawks apiece over 6-12 weeks of coverage. Coastal spring sites rarely see more than 200 in a day, but you tend to see the hawks very close, affording memorable views of individual birds flying at or below eye level. That is quite different from the fall migration, when Wachusett Mountain averages 11,000 hawks, the large majority of which are Broadwings. Fall inland sites can see as many as 10-20,000 hawks in a single day (9 times in 40+ years). Not so in spring. Also, good weather for migration can be quite different in spring. Plum Island does best with strong west or northwest winds most of the season, with strong southwest winds also being helpful in late April and early May. Pilgrim Heights does best on strong southwest winds that tend to push the migrants out onto Cape Cod. The two spring sites see largely different species at different times. Plum is best in April. Pilgrim Heights is best largely in May. There is little if any duplication in birds. Pilgrim’s most abundant migrants are Turkey Vultures, Sharp-shinned Hawks, Broad-winged Hawks, and American Kestrels. It is also the best site to see the occasional, almost annual Mississippi Kite, often on strong hot SW winds at the end of May. Plum’s most abundant migrants are American Kestrels, Sharp-shinned Hawks, Northern Harriers, and Merlins. Plum Island is covered on days with a wind anywhere from the west (SW-NW) above 5-8 mph from the last week of March through May 10. Check the site profile on Hawk Count for migration timing. Least favorable: Anything with an Easterly component (NE-SE). On warm to hot days with a week southwest wind, a sea breeze can develop in mid-to-late morning, driving hawks inland. From Interstate 95 take exit 57 for Route 113 (Newburyport). Travel east on Rte 113 (which becomes Route 1A in Newbury) for a distance of 3.5 miles to the intersection with Rolfe’s Lane (there is a traffic light at this intersection) Take a left onto Rolfe’s Lane and follow to the end of the road which terminates at a stop sign. Take a right at the stop sign. This is the Plum Island Turnpike / Water Street, the only access to Plum Island. Follow the Plum Island Turnpike until you go over the Sgt. Donald Wilkerson Bridge. After you have crossed the Bridge, take your first right. This road will lead you directly to the entrance to Parker River National Wildlife Refuge. There is a daily admission fee of $5 per car, but free admission with a Duck Stamp, Parker River Pass, or Golden Age passport. The watch is conducted from the first parking lot (Parking Lot #1) on your left after you enter the refuge, on the platform where the restrooms and visitor’s station are located. Observers will be there (unless there is inclement weather) on most weekend days, and some weekdays as well, during the months of April and May. The Wellfleet Bay Wildlife Sanctuary, in partnership with Eastern Massachusetts Hawk Watch and with permission from the Cape Cod National Seashore, has been conducting a hawk watch at Pilgrim Heights in North Truro since 1998. The hawk watch officially runs from April through most of May, but watchers may be there on good winds in late March and well into June. Pilgrim Heights averages 1,698 hawks a year with the most abundant being Turkey Vulture, Sharp-shinned Hawk, Broad-winged Hawk, and American Kestrel. Check the site profile for Pilgrim Heights for “Migration Timing”. For more information, please contact Mass Audubon’s Wellfleet Bay Wildlife Sanctuary at 508-349-2615 or wellfleet@massaudubon.org. Pilgrim Heights is located within the Cape Cod National Seashore in North Truro on the east side of Route 6, just north of the Truro and Provincetown town line. Park in the first parking lot and take the Small's Swamp Trail to the second overlook. Most spring hawks move southwest from Connecticut to the northeast west of Newburyport, avoiding the ocean, so look for good southern exposures affording views to the southwest and west. Immature accipiters and falcons tend to hug the coast more, but the biggest numbers of hawks are likely to be found inland when Broad-winged Hawks are migrating, from mid April through early May. Both Wachusett Mountain and Mt. Watatic have been productive spring sites in the past. However, growth of the forest has obstructed viewing areas a bit. Over 600 have been seen in one day at Wachusett. Great Meadows National Wildlife Refuge in Concord can be productive also. Pilgrim Height’s Broadwings are largely late May and even early June birds, as many immature Broadwings return north late, realizing they are not going to establish territory and breed in their second year. They have not flown north before and meander a bit, as they are under no pressure to “get home” this year, and are “trapped” on Cape Cod before they realize they have to fly south again to move north. Southerly, especially moderate to strong southwest winds are best inland in spring. West and even strong northwest winds also can be productive. For a good calendar of spring migration, look at Bradbury Mountain State Park on hawkcount.org/siteinfo.php?rsite=616 Bradbury, near Pownal, Maine, is perhaps the best spring inland site in the northeast east of the Great Lakes. You might also encounter small flights of falcons and accipiters anywhere along the coast in spring, especially on strong west or northwest winds in April or early May. 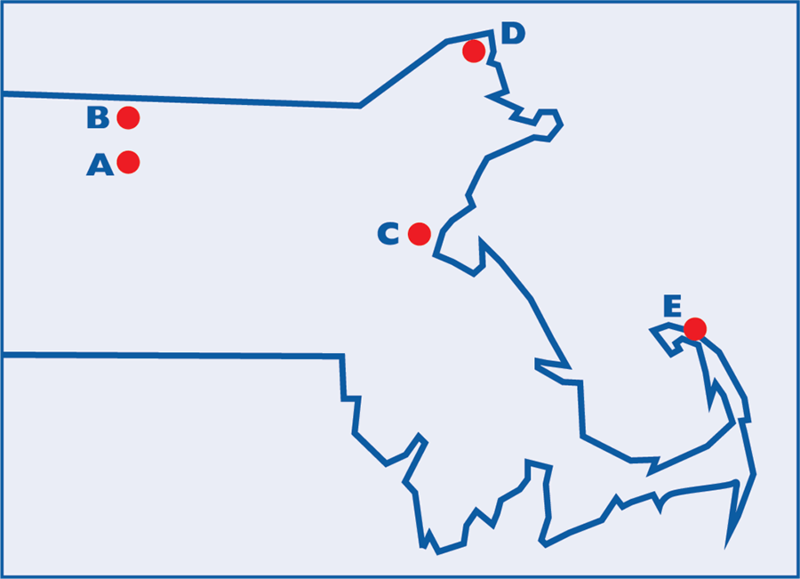 Outer Cape Cod and northern Essex County are likely to be the most productive.